Hatters boss Nathan Jones admitted he hasn’t ruled out handing keeper James Shea his first league start of the season when Town travel to Newport County this season. The number two, who recently signed a new long term deal with the club has made five appearance this season, all of them coming in the Checkatrade Trophy. With Marek Stech at fault for both Coventry goals during the 2-2 draw on Saturday, Jones confirmed swapping his stopper's was an option, but was quick to rally around the popular Czech keeper too, saying: “He’s (Shea) always in our mind. “Unless Marek has a wonderful game, if there are ways we can improve the side then we’re always looking at that. “But Marek’s been a wonderful keeper for us, he really has, he’s been as good as there is in the league. “All keepers have a dip, and it’s how they come through that dip is the crucial thing, so we’ll see. “But we’ve got two first choice keepers, so it's not like we’re not putting in a younger one. 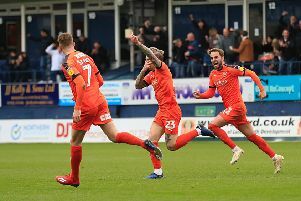 When asked if he had a word with Stech, who was beaten by Marc McNulty's free kick from 25 yards, since the match at the Ricoh Arena in midweek, Jones added: “Yes, we’ve debriefed. “What we say is if the ball goes over the wall into the top corner, nothing he can do. “If he can somehow get there, then that will be a worldie save, but don’t get beaten your side. “The wall does one side, you do the other, and as it was, as happens in football today, sometimes keepers gamble, but what we say is just take the variables out of if, do not ever move.